Little of the Recovery Act's highway funds were actually spent on improving highways. The American Recovery and Reinvestment Act of 2009 (henceforth, the Recovery Act) was an ambitious piece of legislation aimed at providing a fiscal stimulus to combat the negative effects of the 2007-09 recession.1 A major component of the bill targeted infrastructure—particularly the nation's highways. The Recovery Act provided state governments with $27.5 billion in grants through the Federal Highway Administration (FHWA). The Recovery Act represented a major increase in federal funding for highways, as the grants equaled 44 percent of all highway capital improvements made by states in the previous year. Despite the magnitude of the influx of federal funds, the highway system saw little improvement. 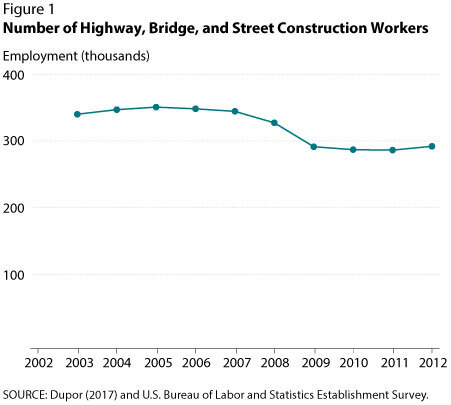 As Figures 1 and 2 show, the number of federal aid highway workers and total value of highway construction remained relatively unchanged in the years immediately after the act's passage. In fact, 40 percent of Americans lived in states that spent less on highway infrastructure in 2010 than in 2008 or almost exactly the same in those years. The table displays expenditures for such states. 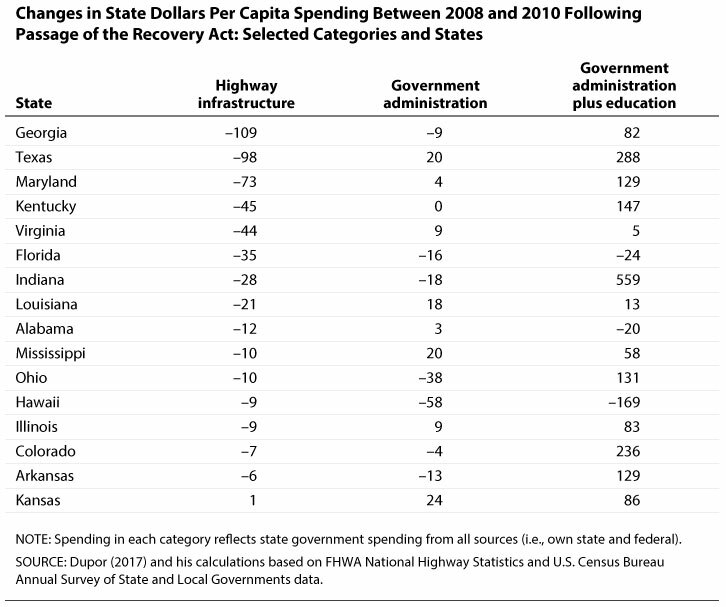 As the table shows, many of these states cut highway spending despite increasing spending in other areas. So, why didn't the Recovery Act substantially increase overall highway spending? The answer may lie in a concept economists call crowding out. In the context of infrastructure spending, crowding out occurs when increased government spending reduces spending from other sources. In effect, we would see federal funds replace—or crowd out—state funds. In the aftermath of the 2007-09 recession, state governments faced drastic declines in tax revenue and would have had ample incentives to repurpose additional highway funds elsewhere. 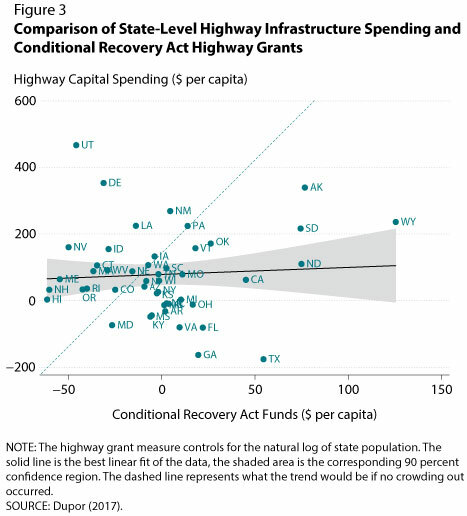 To assess the prevalence of crowding out, Dupor (2017) examines whether states that received relatively more Recovery Act highway aid spent relatively more on highway improvements. In the article, the estimated effect of FHWA aid received on highway spending is 0.19, meaning that a one dollar increase in FHWA raised highway spending by only 19 cents. This implies that for each dollar received, state governments cut their own contribution to highway infrastructure by 81 cents. Further, because the estimate is not statistically significant from zero, the hypothesis of a complete crowding out of state highway spending by Recovery Act highway funds cannot be rejected. Figure 3 represents the article's main results graphically. Each point corresponds to a state. The horizontal axis indicates Recovery Act FHWA obligations per capita (controlled for log population), while the vertical axis indicates the accumulated per capita change in highway spending. The solid line represents the best linear fit, with a coefficient equal to 0.19. If there were no crowding out and no other disturbances, the points would lie on the dashed 45-degree line. If there was a complete crowding out of state funds by federal funds, the solid line would be completely flat. In practice, little of the Recovery Act's highway funds were actually spent on improving highways. 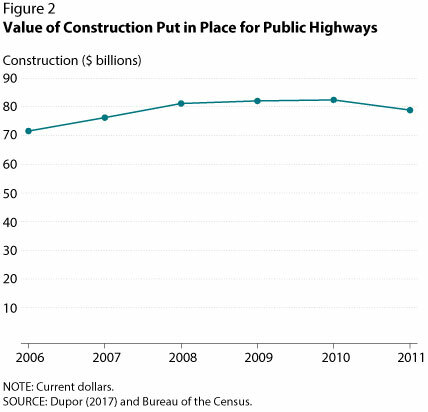 The language of the act itself, as well as incentives for states to repurpose funds, led to overall highway spending levels that were very likely similar to what they would have been without the stimulus.3 The inability of the Recovery Act to substantially improve U.S. highways serves as a reminder that crowding out is a potential problem for any government stimulus and that seemingly small details in legislation can have significant economic consequences. 1 This essay is based on an earlier article: Dupor (2017). 2 American Recovery and Investment Act of 2009. January 6, 2009, p. 93; https://www.gpo.gov/fdsys/pkg/BILLS-111hr1enr/pdf/BILLS-111hr1enr.pdf. 3 It is worth noting that this essay does not consider the possible effect that Recovery Act highway funds may have had on spending in other areas. It is possible that by repurposing highway funds, states were able to prevent additional spending cuts elsewhere. This essay, however, is concerned only with the relationship between Recovery Act highway funds and highway improvements. Dupor, Bill. "So, Why Didn't the 2009 Recovery Act Improve the Nation's Highways and Bridges?" Federal Reserve Bank of St. Louis Review, Second Quarter 2017, 99(2), pp. 169-82; https://doi.org//10.20955/r.2017.169-182.